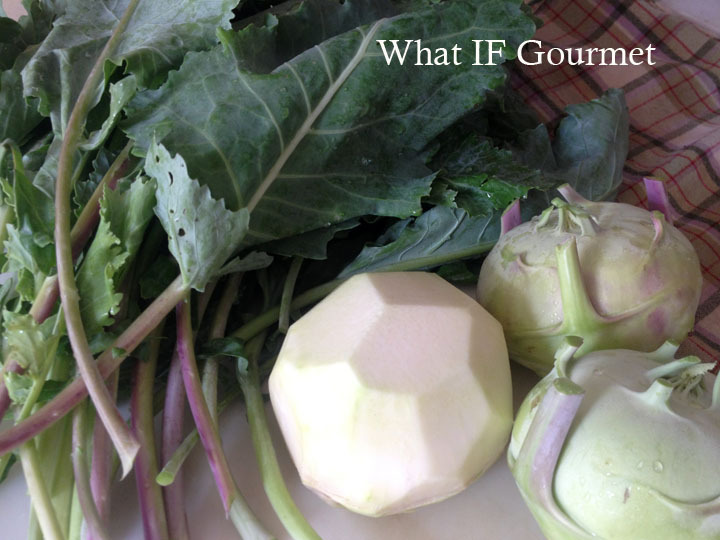 I love the crisp texture and clean flavor of raw kohlrabi bulb, which I find reminiscent of peeled broccoli stalk. Kohlrabi is a member of the anti-inflammatory Brassica family, along with cabbage, broccoli, and kale, to name a few. Both the bulb and the greens are edible, but while the peeled bulb can be enjoyed raw or cooked, the greens should be cooked until tender. It’s easy to peel kohlrabi bulb using a large vegetable knife to cut off small slices, shaping it into a sort of geodesic dome. This fresh, bright salad combines crisp, raw kohlrabi bulb with tender, sauteed greens in a lemony, peppery dressing with a pleasing hint of garlic. It is delicious served immediately at room temperature, but only improves in flavor when chilled for later in the fridge. You can use any type or combination of pepper you like, but I particularly enjoy this salad with a Creole pepper blend containing red, black, and white peppers along with a little garlic powder. Separate the bulbs from the greens. Peel the bulbs and cut them into about 1/4″ dice. Slice the scallions, both white and green parts. 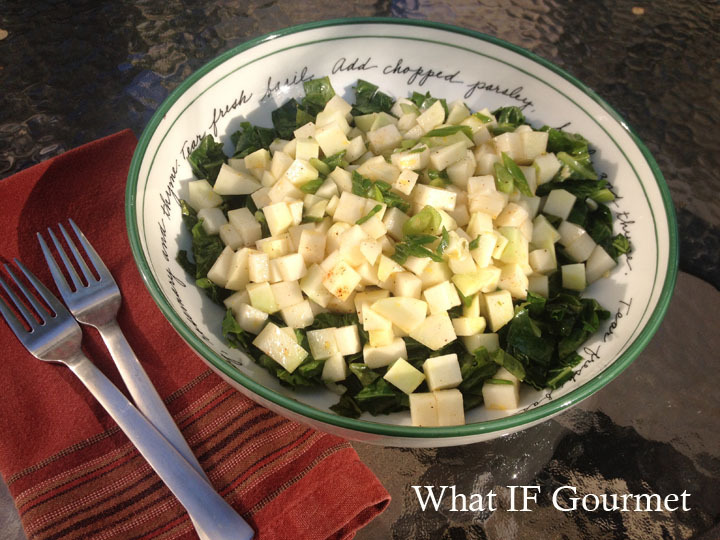 Combine the diced kohlrabi bulb and scallions in a small bowl. Zest and juice the lemon. Add 1 tsp fresh lemon zest, all of the lemon juice, 1/4 cup olive oil, 1/4 tsp salt, and Creole pepper blend (to taste) to the bowl with the vegetables, and toss well to combine. Set aside to marinate. 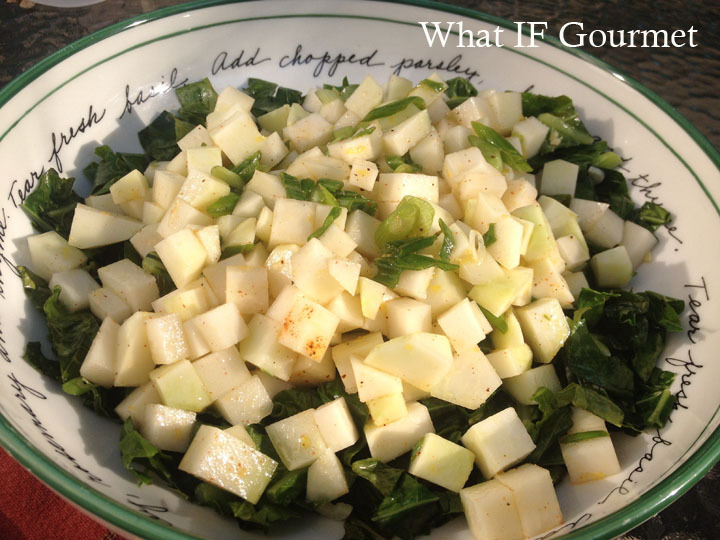 Meanwhile, wash the kohlrabi greens and leave the water clinging to the leaves. Roughly chop or slice the leaves into ribbons. Heat 2 Tbsp olive oil in a large skillet over medium heat. Peel and crush the garlic clove and add it to the skillet. Cook, stirring, about 30 seconds. Add the wet greens and use tongs to turn them, coating them in the hot oil. Continue to cook the greens, stirring occasionally, for 5 to 10 minutes, or until tender. Season the greens with salt to taste, and spread them out to cool slightly in a wide, shallow bowl. Top the greens with the raw kohlrabi and scallion mixture. Serve immediately at room temperature, or chill to serve later. 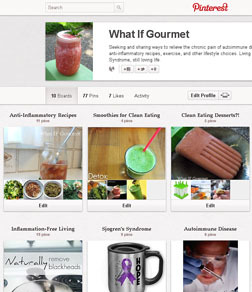 This entry was posted in alliums (garlic/onions), Anti-Inflammatory Ingredients, Appetizers, citrus, cruciferous vegetables, Dairy-free, Entrees, fruit, Gluten-free, greens, herbs, monounsaturated oils, Nut-free, Recipes, Snacks, Vegan, Vegetarian. Bookmark the permalink.